Condition: Fair to Good: center pearl does shown sign of nacre loss–fair conditon. Rest of earring is in excellent condition with no signs of verdigris or plating loss. Material: Brass, Gold-tone plate, crystal, glass, faux pearl. 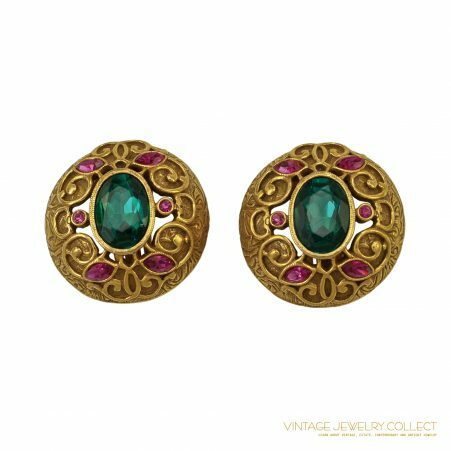 Description: Earrings, clip, c. 1950s, brass, “Russian Gold” gilt plating. Haskell-style clip earrings bejeweled with rose montees and faux pearl center. 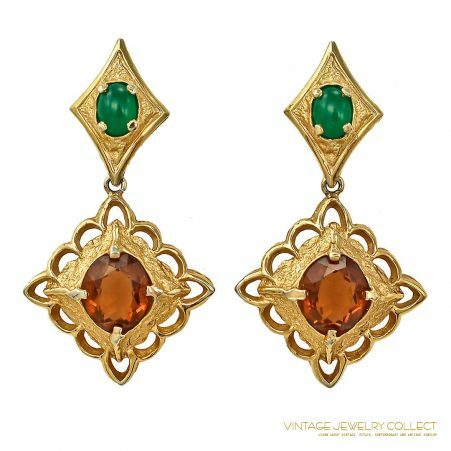 Earring design consists of three layers of gilt filigree findings surmounted with two distinguishable sizes of glittering rose montee rhinestone accents.